I just love the change of seasons... gorgeous new colour palettes and whole new opportunity to revamp and mix-up your wardrobe. The high street is nailing it with the warm, vivid and wonderful autumnal shades, especially Zara in particular. So I thought what better way to kick off A/W shopping by including some of my favourite picks. A new season is always a good excuse to shop - a totally acceptable one too! Zara's simple knits are £19.99 and just a fab essential. Each year they update the style and this time around they have added a pearly cuff - a nice finishing touch. I love mustard, it looks awful on me but i'm constantly drawn to the colour, it certainly makes an appearance most seasons too. These are great for layering as it gets chillier. I couldn't love this bottle green Blazer more, another Zara winner. What did I tell you?! I have a blazer this colour and my mother curses every time I wear it, supposedly it looks old and bobbly (maybe a tad!) but it's been in my wardrobe for years and I still love it. Perhaps it's time for a little update? They have it in several colours and although at first I wasn't so keen on the ruched sleeves, I think I've come around. You just can't go wrong with having multiple blazers in your wardrobe - there's a style for everyone! Blue is my favourite colour, any shade - you name it, I've got it! 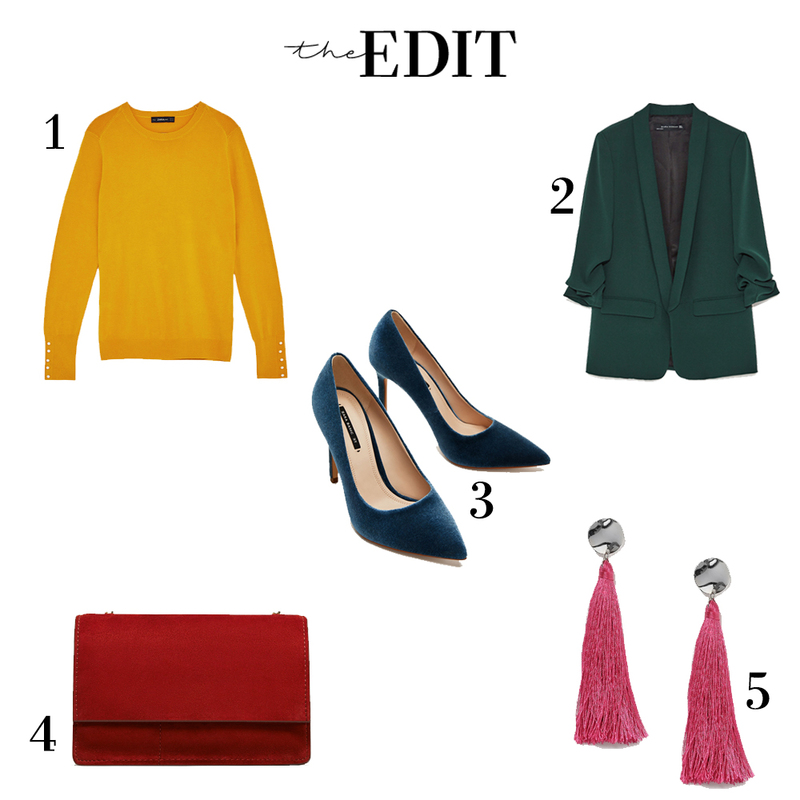 These velvet petrol blue heels are perfect for winter, as I mentioned, taking it up a notch on the colour scale. I have to say Zara are one of the best fit court heels I've found yet. Of course with shoes, it's nearly impossible to recommend a style as everyone has different size and shape feet, however I've fallen out of many court heels in my time and I've finally found some that I don't ..so if you were stuck in the same predicament I would highly recommend. Red is the colour of the moment and I just can't get enough. Despite owning A LOT of bags, red is the only colour I don't have. Criminal, I know! I'm on the hunt to settle that issue and I have to say, I do enjoy a bit of suede. Perhaps I may have found the next wardrobe addition? No surprise, it's Zara again! You'll all be pleased to know I've mixed it up a bit and chucked Topshop in the mix.. the other four picks were meant to be a variation of stores but I will let it be on this one occasion. I love the pop of pink with these earrings and the silver disc stud (there's a lot of this style in different colours everywhere, Next stocking nearly the same pair!). It's amazing how something like earrings can finish off an outfit. The best part, they require minimal effort! Just wondering how many times I've mentioned Zara in this post? Zara, Zara, Zara.. zzzz. Yeah.....We all love the change of seasons.We want to change our style and new colour palettes.College essay competition is on next week,there I want to perform well at essay writing on philosophy topic.Is there any topic you know.Please share it here.And also please share the writing services details that are available on web or very famous service that you know with me.I done a lots of essay works earlier but I am new at philosophy essays.So I worried to write it.Please helps me.....Is it better to refer essay writing service?Are they provides better reviews?